March 8th marked International Women’s day. This year’s theme is “Press for change” and encourages girls and women in all walks of life to challenge gender stereotypes and fulfil their dreams, whatever they may be. Motorsport has long been considered the domain of men; be it karting, rally driving or Formula 1. In the past this could be attributed to the heavy steering, braking and G-forces of F1 cars demanding physical strength beyond that of all but the fittest of women drivers. But with advancements in technology today, racing has become less about strength and more about skill and daring. And yet, there are still no women drivers in the world’s elite racing events. As fans of motorsport and running a number of road rallies of our own, we at Prestige wanted to share a few inspiring stories we’d discovered about women in motorsport and initiatives for young women who want to get into the industry. Susie Wolff was a test driver for the Williams team from 2012 until 2015. She is an ambassador for Mercedes and has joined forces with the Motor Sports Association to set up the new initiative, Dare to be Different (coincidentally our mantra here at Prestige too), which is aimed at promoting equality for women in the world of motorsports. Susie believes the under-representation of women in the sport is not down to a lack of physical strength and is more of a question of numbers and attitudes which can be traced back to when drivers take up motor racing as children. Dare to be Different takes school girls to karting tracks and encourages their participation in competitions and other racing projects. It is a not-for-profit membership-based project committed to inspiring, connecting and showcasing female talent in the motor sports industry. A lady in her seventies and still living her dreams, is former rally driver 'Bron' Bronwyn Burrell. 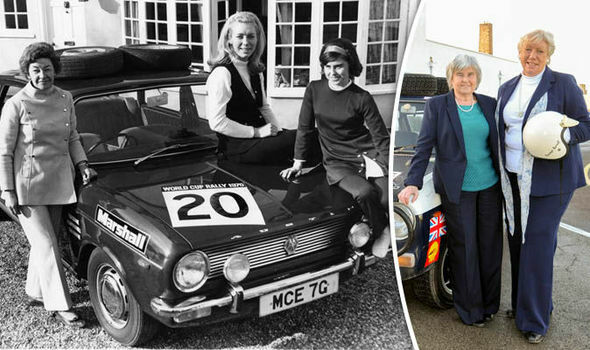 In 1970, aged 25, she and co-driver, Tina Kerridge, embarked on a once-in-a-lifetime rally adventure from London to Mexico in the World Cup Rally series. The Austin Maxi they drove was affectionately nicknamed ‘Puff the Magic Wagon’ because it helped them to “fly”. They got as far as Argentina before “Puff” broke down. Five decades later, Bron managed to track down her old car. “Puff” was restored to his former glory. Bron was reunited with Tina and regained her competition license. For a third crew member they recruited Seren Whyte and took part in the London to Lisbon Rally last year. They finished 3rd in class and 39th out of of 78 drivers! So now it’s over to you ladies! Are you ready for a challenge? Come and test your driving skills and get the adrenalin pumping on the drive of a lifetime. Prestige rallies have always been female friendly but unfortunately women drivers and co-drivers are still in the minority. We would like to offer a little extra to any lady driver or co-driver who signs up to take part. When you sign up to our “Monte-Carlo or Bust” Rally we will give you a year’s subscription to Dare to be Different. This offers you the opportunity to be part of the movement for change as well as giving you exclusive discounts and chances to win tickets to motorsport events, signed memorabilia and factory tours. It also gives you access to their member-exclusive Facebook page, where you can connect with other members, including some that are currently working in F1. Do you own a classic, luxury or special interest car you’d like to put through its paces (we can arrange car hire if you don’t)? Take a look here at details of our “Monte-Carlo or Bust” Rally, May 5th -11th - Who will your passenger be?